Culture.pl indulges in a list of Poland's favourite bedtime cartoons that were part of the classic Dobranocki series from Polish TV's past. Broadcast on TVP1 (Polish national television) since the 1950s, Dobranocki is an instalment of cartoon shorts that marked every Polish child's bedtime. Over soxty years, despite minor scheduling modifications across the decades, the programme ran from 7pm and 7:30pm, right before the evening news. The names Dobranocki and Wieczorynki mean good nighters and eveningers respectively, and episodes wrapped up with a delightful 'DOBRANOC' (good night) sign inviting children to settle in for sleep with their beloved characters in mind. Foreign cartoons began joining the broadcast in the 1970s, and kids today are more familiar with Disney and Pixar – but bring up Jacek and Agatka or the Teddy from the Window in a crowd of Polish adults and watch the emotions stir. These Polish cartoon characters are far better behaved than their counterparts from across the Atlantic, and apart from one rude teddy from a certain window, they don't bank on cheap laughs. Dobranocka / "Jacek i Agatka" / odc. 5 - Gdzie są farby? These archaic finger puppets are the oldest characters on Polish television. The brother and sister first appeared on 2nd October 1962 and their popularity exceeded all expectations. They continued to air three times a week for 11 years. The cartoon reflected the realities of the period: black-and-white images, getting by on a zero-sum budget. In one of the first episodes, Jacek addresses their colourless reality. Before going to bed, he ponders a glass object. He explains that in reality it is coloured and that he believes that by putting it under his pillow, he would colour his dreams. Created by Wanda Chotomska, the polite siblings paved the way for all subsequent Polish cartoons. BOLEK I LOLEK - "SPORTOWCY"
The adventures of the two brothers were televised for 24 years starting in 1962. Unlike Tweedle Dee and Tweedle Dum, one is tall and thin, the other shorter and chubbier, and they are not as generally annoying. Bolek and Lolek (or Jym & Jam and Bennie and Lennie, in English-speaking countries) are very entrepreneurial and always find a clever, non-invasive way of overcoming challenges. 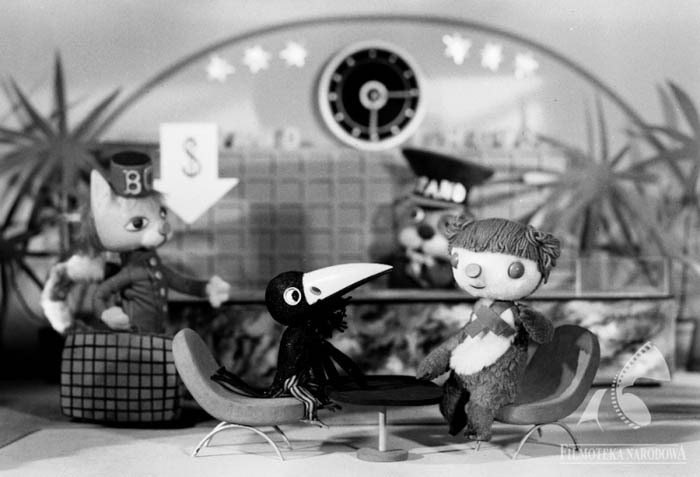 Bolek and Lolek were joined by Tola in 1973, a girl character requested by girls in the viewing audience. However the resolute Tola only took part in 30 episodes. A recognised Polish production, the cartoon aired in 80 countries around the world and was one of the few animated movies allowed to be broadcast by Iranian television just after the revolution of 1979. While Snoopy lies around on his rooftop, Reksio is capable of repairing his own dog house. This multi-talented polyglot is friends with the hens, cats, other dogs and their owners. The cartoon with the anthropomorphist mongrel dog surfaced in 1967 and ran until 1990. Coming from the clipboard of Lechosław Marszałek of the Bielsko-Biała Cartoon Studio, Reksio made it to 65 episodes and became the People's Republic of Poland most recognised dog, alongside the German shepherd from Siberia, Szarik, from the live-action black-and-white war series Four Tank-Men and a Dog. If it weren't for an epic gaffe by Bronisław Pawlik, the zany actor who played comic parts in various movies, a man and talking teddy bear would never have attracted so much attention. After being pent up in a window talking to a stuffed bear for years, the trained theatre actor said 'And now my dear children, you can kiss the teddy on the arse' [editor's translation] while the cameras were rolling. This momentary lapse cost him his job. Miś z Okienka (Teddy in the Window) aired from 1958 to 1973. Apart from a conspicuous 'mmeeee' here and there, this Polish Goofy is naive and clumsy. The stories centre on his journey to find Pacanów, a Polish town where he believes he can get goat shoes. He travels to various corners of the Earth, from Africa to the Wild West. Literally translated as 'the Duffer Billy-Goat', Koziołek Matołek was first created in 1933 by Kornel Makuszyński. Two books of his feats inspired the animated small-screen series created by the Film Miniature's Studio, which aired from 1969 to 1971. His antics only graced the screens from 1973 to 1975 – but his resourceful ideas bemused and amused. In a country under foreign rule with empty store shelves, Dobromir's inventiveness lent support to and inspired a lot of DIY. The boy uses his brilliant ideas to help his grandfather with small household repairs or gardening. Its twenty episodes, each 10-minutes long, starred the red-haired boy and were created by Roman Huszczo and Adam Słodowy, the man behind the popular TV show Do It Yourself at the Film Miniature's Studio. Every country has its favourite bear, and this is Poland's. 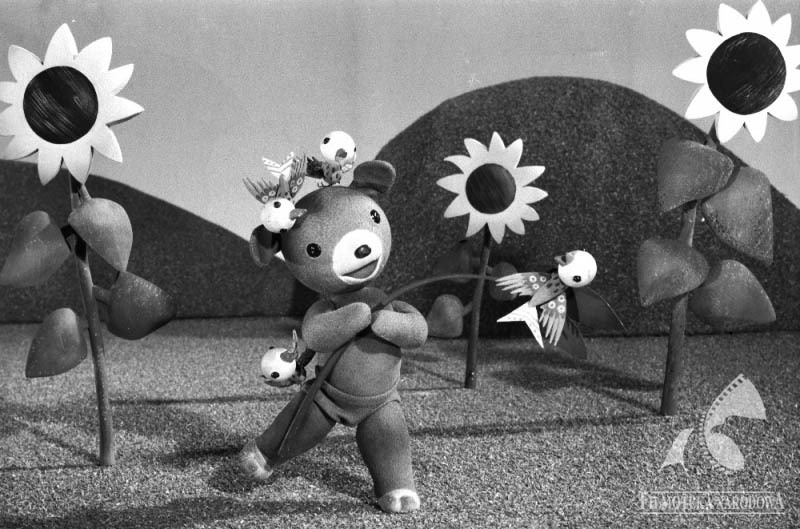 The eponymous star of Miś Uszatek (Teddy Floppy-Ear) was a children's celebrity. He demonstrated prudence and wisdom while retaining a will to experience and have fun. He had everything it takes it be a good leader and presided over a gang of lovable mischief-makers that included Rabbit, Piglet, Bunnies and a dog. His cartoon version was first animated in 1975 by Se-ma-for, the lusciously resourceful animation crew at the Łódź Film Studio. That 10-second animation was the result of 240 movements of a 20-centimetre doll. In a unique combination of mythological themes (the Dragon of Wawel Hill) and Mediaeval realities (the castle of King Krak) with modern gadgets such as cars and phones, this cartoon was an animated spy drama. The most popular thriller of the 1969-70 season, Professor Baltazar Sponge was created by Stanislaw Pagaczewski and turned into a cartoon in the 1970s by the Animated Film Studio in Bielsko-Biała. Unlike other teddy characters, this free-spirited cub lives with his parents and isn't the natural leader of the forest animals. Everyone around likes him, but his head-in-cloud attitude is often the cause of worry. He is always late for class, gets bad grades and dreams of becoming a singer while having an awful voice. But on one of his journeys he proves that dreams can come true and starts singing beautifully. From then on he takes over the cartoon's lead song, its music composed by Mireille (episode 1-27) then by Jean Michel Defaye (episode 28-53). Colargol's story dates back to the 1950s when French writer Olga Pouchine made him the protagonist of a series of her bedtime books. Albert Barillé, the French producer, picked up on the story and, with the help of set designer and co-scriptwriter Tadeusz Wilkosz, they turned the book character into an animated puppet at the Polish animation studio Se-ma-for in Łódź. The cartoon was popular in the USA and UK (where Colargol was known as Barbany), Canada (where he took the moniker Jeremy), Israel, Norway, the Netherlands and Afghanistan. He lived in a stork's nest – very Central European – and often got into trouble, but unlike Tweetie, he didn’t have to worry about a prying cat. This little bird was created by the Łódz studio Se-ma-for and appeared on Polish TV between 1983 and 1989. The little dumpling girl who managed to escape the kitchen table is an adventurous creature who sets off into the world. Her travels, divided into 13 episodes that aired between 1977 and 1983, took her through Poland. This folk cartoon showed the country's various regions and local customs and traditions. Originally Swedish-Finnish, these lovable marshmallow-like hippos with snouts were created by illustrator-writer Tove Jansson in 1945. They ended up speaking 43 different languages. Nine books provided rich material for animated adaptations in countries around the world. In 1977, Łódź film-based Se-ma-for created the TV series Tales of the Moomins. The cartoon was made with the use of semi-flat animated puppets on glass. Poles followed the carefree, adventurous family who live in Moominvalley till 1982. 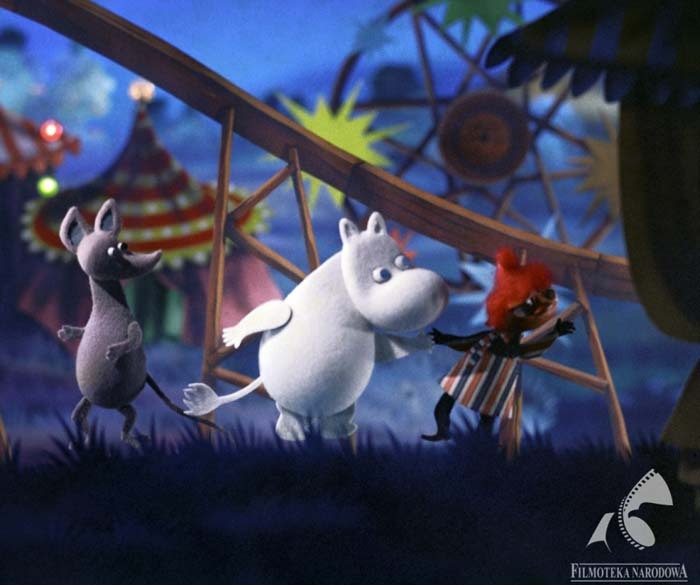 Years later, apart from their own theme park (Moomin World in Naantali, Finland), the little creatures have starred in four feature films in Poland. Yet another pioneer of Polish bedtime cartoons, this little goose and her lisping friend Ptyś the Chicken are contemporaries of the above-mentioned Jacek and Agatka. The static board cartoon started being televised in the 1950s. The naive reckless waterfowl first made her appearance in the well-known children's magazine Świerszczyk (The Cricket), created by Anna Hoffman. With his titular Zaczarowany Ołówek (The Enchanted Pencil), Peter, the hero of the cartoon, can draw virtually anything. With a faithful four-legged companion by his side, his materialised drawings help him get out of trouble. Over three dozen episodes were created by Se-ma-for Studio between 1964 and 1979. Unlike Tom or Sylvester, these two cats don't let some small mouse or a yellow bird with a disproportionally large head ruin their day. Filemon and Boniface are a well-balanced duo with Filemon in the role of the young, curious novice, and Boniface the elder who shares his precious widsom. The trouble is that his level of activeness resembles that of Garfield. His favorite occupation is lying down on top of a brick oven. The first series of this bedtime cartoon, The Strange World of Filemon the Cat, was created by Se-ma-for between 1972 and 1977 and consists of 13 episodes. The second series includes 26 episodes and is known as The Adventures of Filemon the Cat. They additionally earned four full-length features. Pik-Pok came long before the Penguins of Madagascar. And unlike the nervous, asthmatic Wheezy from Toy Story, Pik-Pok is opitimistic and curious. His inquitiveness brings him to leave his home – the Island of Snowy Storms. His adventurous made for 26 nine-minute episodes featured in the 1980s and 1990s. And in case you're wondering, yes, he pre-dates Pingu. This Heckle and Jeckle of Polish cartoons struggle with a dark sorcerer named Plimplan, but unlike the talking magpies, they are well behaved and try to contribute to the well-being of all the inhabitants of the forest. The Se-ma-for Studio created only 13 episodes but they entered the cartoon favourites of an entire generation in the 1980s nevertheless. While Shrek had its courageous and virtous gingerbread man, Polish kids hoped to be able to make their own Plastuś who would accompany them to school everyday. The little playdough man (aka Plastuś) has Dumbo ears and lives in a world of stationary, taking it upon himself to wake up every object in the pencil case for school. Maria Kownacka's playdough man first appeared in books as early as 1936 and she then narrated his diary in a Se-ma-for animated series in the 1980s before she passed away.